I think it’s time that we (and by we, of course I mean “I”) devote a second to Mazda’s swing vents, because it’s a topic that the mainstream automotive media, of which I am a part, are continually ignoring. This is almost certainly because no one cares. But I care, and so does an alert reader who contacted me to tell me about the swing vents. But I already knew, as did four or five others out there, none of whom have a life either. 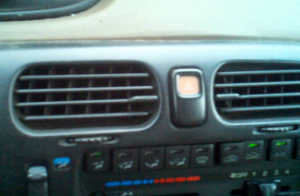 Here’s how it worked: you got in your early 1990s Mazda 626, put on the air conditioning or heat, and voila! The air pushed out of the vents as they moved back and forth. The result was your cabin was wafted with air, much like you’re royalty from thousands of years ago – you know, the ones that are always sitting in a throne-like chair while servants spread air back and forth using giant leaves. I know this feature made it on the Mazda 626, and I think it was on the 929 as well. Supposedly, the first-generation Lexus LS400 also had it, though I’m unable to confirm that as first-gen LS400 owners are all currently asleep in their retirement communities. The LS430 may have also used it. The Volkswagen Phaeton did not have oscillating vents, as many people think, but rather wood vent covers that electronically went up or down when you activated the climate control. If you have a Phaeton now, at least two of these probably still work. Unfortunately, oscillating vents seemingly have gone the way of the carburetor – probably because they made absolutely no sense in the first place. Maybe Mazda could’ve made a competitive minivan if they hadn’t spent so much money on the damn oscillating vents. I think these are perfect! Whenever I’m driving, I always try to set the automatic climate control to the perfect temperature. But, it is inevitably too cold or too hot, so I have to keep on adjusting the temperature degree by degree and not focus on all that driving that I should be. But, if these vents were in my car, I could get blasted by A/C and feel cool, and just when I’m about to get hot, another blast! I don’t understand why no one offers this on their cars. I had the 626, this feature was awesome! Almost made up for the automatic seatbelt. My Audi A4, which I otherwise love, has the annoying habit of swinging one of its vents upward and remaining in that position. So while it does not actually oscillate, it does do its own version of the auto-rotate thing. Of the two Mazdas I have owned, ’73 RX2 and ’82 GLC, the vents were unremarkable and only moved with a physical prompt by the driver. The RX2 did distinguish itself by outrunning an early 70s MB 280SE 4.5 in the Anza Borrego desert, east of San Diego. I think it’s unfair to generalize that all LS400 owners as being asleep in their retirement communties when it is perfectly reasonable to assume most of the 1st gen buyers are now dead. My mother had a (then) new 1998 626 ES and this vent feature was fantastic. It was also able to be turned off with the push of a button. I really wish it was common on more cars. These were the greatest things ever. Truly a shame Mazda didn’t keep these going. They seriously couldn’t be that complicated or $$ to include. They need to make a comeback!! I worked with a guy who was a total d-bag and he bought a new car shortly after me. 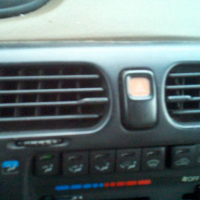 He bought a ’94 Mazda 626 LX and made a point of showing me the oscillating vents that my Accord didn’t have. I thought it was pretty frivolous at the time, but a few years later another friend had a 626 ES and I realized that it was a very neat feature. Why more cars haven’t sported them over the years doesn’t make sense. I wonder if complexity/cost and reliability were factors that kept the idea from spreading? This feature continued on to the demise of the 626. A friend with a 2001 626 had this feature. This is the first I’ve heard of this feature. It seems pointless, but I like the fact that it’s the automotive equivalent of sticking your foot out from under a blanket when too hot, and completely stealing the blanket from your girlfriend when too cold. I had an 88 626.. it had the swing vents but IIRC they where activated by a switch on the dash. The a/c in mine didnt work but the vents sure did. Who cares about a/c when there is a turbo to keep your mind occupied. My grandmother had a 626 with one of these. It was cool in a gimmicky sort of way, but not cool in a refreshing sort of way because just as you were enjoying a nice breezy blast of A/C goodness it went away. Then it came back suddenly. Then went away again. It was the ultimate tease on a hot summer day. I do think you could disable the oscillation (I’m quite sure this article now ranks #1 on Google for oscillate), but I’m also sure that my grandmother had no idea how to do that. 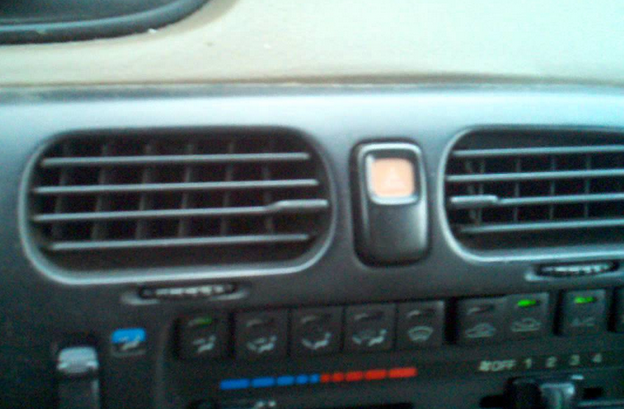 I had 2 Mazda’s in the ’80s-early ’90s and LOVED the oscillating vents. Replaced the last Mazda with a ’94 Camry which has been good, but have greatly missed the moving vents. I want to replace the Camry soon. Are the oscillating/swing vents no longer on any cars? How can I find out if they’re around? That’s my first priority in selecting a new car – I liked it THAT much! I remember them on the 626 when they were new. I also have a 2003 LS430 that has a much improved version of the same thing. However, the last time I checked, I’m not dead yet…. First, the inside of the Lexus is always the perfect temperature, so the wafting of a breeze is a nice touch while I listen to my arteries harden. 1. With the dual climate activated, each of the two center vents oscillate independently on one another. A playful asymmetric detail. 2. If you turn off the dual climate AND there is someone in the passenger seat, they will continue to operate independently. 3. If you turn off the dual climate and there is no one in the passenger seat, the vents will s.l.o.w.l.y sync until they oscillate together. 4. If you get bored with this, there is a button to turn them into static, boring vents. I think about how much it cost to do this sometimes, usually when I’m doing 85mph on a deserted freeway and there’s plenty of time to ruminate on such things. I’ve decided that whomever works on designing Lexus automobiles, at least in 2003, was/is a very through human being and I want to congratulate him on something I enjoy very much. Also something they discontinued in 2007 and thus has stopped me from replacing my LS with 179,000 mile with a new one… at least until the one in my car breaks, which will likely be never.